Enlarged tonsils are common and many times do not pose any risk. If you have difficulty swallowing, a loss of appetite, or irregular sleep patterns, you may have a condition called tonsillar hypertrophy. When these or other symptoms begin to affect your regular daily activities, it is time to take action. We will discuss the causes and both the medical and natural tonsillar hypertrophy treatment options available. Our tonsils are soft lymphoid tissue masses located on either side of the back of our throat. Like the adenoids of the nasal cavity, the tonsils’ primary role is to prevent bacteria and viruses from attacking our body by releasing white blood cells to fight the infection. When the tonsils become swollen or enlarged, it is referred to as tonsillar hypertrophy, or tonsil hypertrophy. This can lead to complications such as difficulty breathing and swallowing. Tonsillar hypertrophy in adults does occur but is more common with young children. Enlarged tonsils may be present at birth or develop as a result of an infection. In most cases, infection of the tonsils is the root cause. The main sources are acute tonsillitis, chronic tonsillitis, and peritonsillar abscess. It can also be linked to streptococcus bacteria or the Epstein Barr virus infections. Some experts have suggested environmental factors such as second-hand smoke and pollutants may cause the irritation and inflammation of the tonsils. As the tissue swells, the tonsils may expand large enough to cause a partial blockage making it difficult to swallow. Pain may also be part of this symptom. When it hurts to eat, it is easy to lose interest in food. The swelling of tissue near the vocal cords can cause a change in the tones of the voice. Tonsillar hypertrophy caused by infection can result in cases of bad breath. Depending on the size of the blockage caused by the swelling, the airways may produce a snoring effect. If the tonsils block the Eustachian tubes, it may cause a buildup of fluid behind the eardrum and ear infections. As with the ears, improper drainage due to enlarged tonsils can create an issue with the sinuses. Symptoms of this include congestion, fatigue, and a pressure sensation. Severe cases may cause sleep apnea, as the airways become blocked during sleep. The constant short suspension of breathing can lead to heart complications. With the possible complications enlarged tonsils can lead to, most cases need immediate treatment. Antibiotics are the first medical response for infections, and an antihistamine may be prescribed if caused by an allergen reaction. 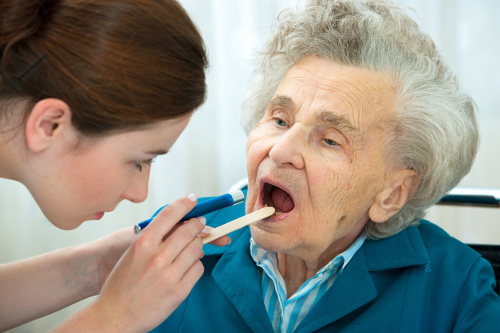 In severe cases, surgery may be required to remove the hypertrophic tonsils and adenoids. It is usually performed as a day surgery and under general anesthesia. Surgical risks include a reaction to the anesthetics. This may cause nausea, vomiting, headaches, and muscle pain. As the procedure is done through the mouth opening, there may be breathing difficulty after the surgery due to a swelling of the inner mouth and tongue. All surgeries have risk of bleeding, both during the procedure itself and after during recovery. It is important to follow all post-op instructions to prevent infection as well. During recovery from tonsil surgery, a patient can expect to spend the next 10 to 14 days resting. Fluids and soft foods are required to maintain hydration and acquire nutrients. Surgery is not as common as it once was and is usually done in less than 30% of the cases today. Other treatment options may include ozone therapy, climatotherapy spa treatment, ultrasound therapy, and vacuum hydropathy. There are a few natural home remedies that may help with the symptoms of tonsillar hypertrophy. Inhaling steam may help reduce any nasal mucus and promote drainage for improved breathing. Use salt in warm water to gargle to treat aches and pain in the throat region. It will also prevent the infection from spreading. Use this treatment in conjunction with steam inhalation for best results. The antimicrobial properties of raw honey and the anti-inflammatory properties of turmeric can be used to help reduce the swelling and prevent further infections. Use an equal amount of both to create an edible paste to take four times per day. Tonsillar hypertrophy can cause an array of symptoms that may disrupt sleep and daily activities. It may also go unnoticed in those with no obvious symptoms and naturally shrink over a few years span. Due to unknown causes, some people are born with enlarged tonsils, which may lead to serious issues. Enlarged tonsils may also be caused by infections. Years ago, the main treatment was surgical removal of tonsils, but today most cases are treated with drugs with surgery being the last resort for severe cases. Natural remedies may help to alleviate symptoms and prevent further complications. “Tonsillar Hypertrophy: Causes, Symptoms, Treatment – Antibiotics, Tonsillectomy Surgery,” ePain Assist; https://www.epainassist.com/face-mouth-throat/tonsillar-hypertrophy, last accessed April 10, 2017. “Adenoid and Tonsillar Hypertrophy,” Southlake Sinus and Snoring Center; http://dfwsinus.com/nasal-airway-obstruction/adenoid-tonsil-hypertrophy/, last accessed April 10, 2017. Salina, “What are Hypertrophic Tonsils? Its Symptoms and Natural Treatment,” Simple Remedies, May 7, 2013; http://www.simple-remedies.com/home-remedies/throat-obstruction/hypertrophic-tonsils-treatment.html, last accessed April 10, 2017. “Tonsillectomy,” Mayo Clinic; http://www.mayoclinic.org/tests-procedures/tonsillectomy/basics/definition/prc-20019889, last accessed April 10, 2017. “Tonsil Hypertrophy,” I Live OK; http://iliveok.com/health/tonsils-hypertrophy_77646i15951.html, last accessed April 10, 2017.